Once again, you take the role of Master Higgins; a tropical hero. This time, the evil witch doctor has nabbed Princess Leilani's sister Tina. Master Higgins is aided on his quest by his trusty skateboard and stone axes which he can throw, as usual... but now also has the help of four dinosaur types which he can ride: Blue Camptosaurus (tail-whipper), Red Camptosaurus (fire-breather), Pteranodon (able to fly and drop rocks) and Elasmosaurus (able to swim quickly.) You will need to traverse several islands in order to reach your goal. 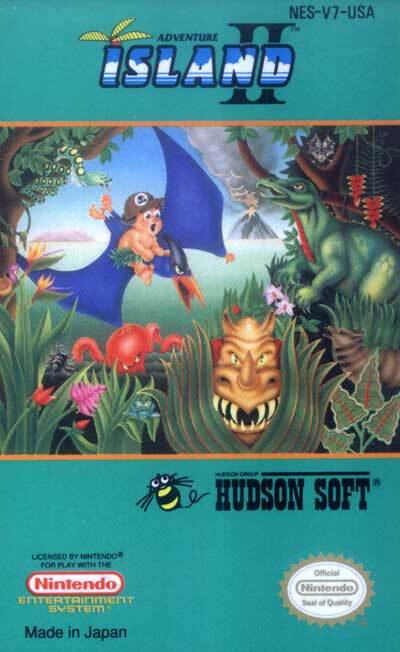 Adventure Island 2 is generally considered to be an improvement in fun-factor (lower difficulty/more accessible) when compared to the original; the levels are shorter in length, 1up's are more plentiful, and dinosaurs/weapons can be stored/swapped in-between levels.